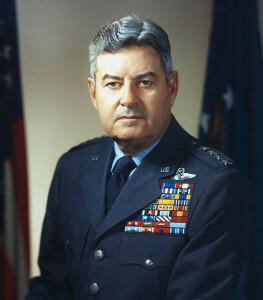 A career military aviator, LeMay was one of the architects of strategic bombing doctrine during World War II and was especially effective as commander of the Twentieth Air Force, which conducted the strategic bombing of Japan, culminating in the dropping of atomic bombs on Hiroshima and Nagasaki on August 6 and 9, 1945, which brought the war to an end. In the postwar era, LeMay assembled and commanded the Strategic Air Command, a major component of the U.S. “nuclear deterrent,” which simultaneously threatened and prevented World War III. Conservative and irascible, LeMay was uncompromising in his military and political views. He retired from the U.S. Air Force in 1965 and, three years later, was running mate to segregationist candidate George C. Wallace on a third-party presidential ticket.